Danny is hiding behind the mall, painting her toenails to stay sane, when a superhero hits the ground right next to her. It’s Dreadnought, the most famous superhero on the planet, and he’s dying. With his last breath, Dreadnought passes his mantle of power onto Danny so that the world doesn’t lose his abilities. And it changes Danny more than she ever thought possible. Danny is transgender, and Dreadnought’s power has given her the body she always felt was rightfully hers. But with her dad refusing to accept her identity, her best friend acting like he’s suddenly entitled to date her, and a whole lot of superhero politics to catch up on, Danny’s life is hardly simple. And there are bigger problems. Who killed the previous Dreadnought, and why? What are the Legion hiding? And how far will Danny have to go to protect her new friends? I completely love this book. The emotional tension is so high I almost forgot to breathe. I’m so glad I had it on the kindle app on my phone, because I was reading this on escalators and under the desk at work. Danny’s voice is so vivid and clear, and I was completely pulled into New Port City, and the Legion Pacifica, blackcapes, greycapes and whitecapes. All I can say is that, for me, this was an emotional journey to follow. Even though the physical transformation is obviously much more instantaneous than it would be in real life, Danny still has to adjust to the dramatic change, and find the people she can trust with her suddenly much more public identity. Everything changes for Danny, even though this is the body she always knew she should have. Encountering the boys at school is an… experience. Then there’s the necessity of different clothes, different permissible behaviours, and different emotional responses. And Danny’s struggles to get her parents to understand that this is who she really is are heartbreaking, but sadly not dissimilar to what many trans people experience in reality. This is an origin story about expectations. The expectations on Danny from her parents, from the superhero – or cape – community, but also from herself. She faces opposition from all directions – trigger warnings for some serious slur usage, intentional misgendering, transphobia and emotional abuse from a parent. But Danny also finds new friends who will support her with full hearts and without question. The treatment of white, non-intersectional feminism was honest, and I think will challenge people. I’d be interested to see where this goes in the next book. I really loved the world-building detail. The history of superheroes, metahumans, whitecapes and blackcapes is well-plotted, and there’s a real focus on the destruction that metahuman fights can wreak on a city – something that’s often lacking in superhero narratives. Dreadnought may be about a girl who can fly through the sound barrier, but it keeps its feet firmly on the ground. I would have liked to see a reflection on Danny’s friendship with David towards the end – he was her best friend for a long time, and though his exclusion is more than validated, I think it would have affected Danny more to not be able to rely on him any more. Maybe this will be dealt with in the second book as well – no matter how famous Danny is, surely she’ll have to go to school? This is my favourite read so far of 2017, and my first five star review of the year. It’s a tense and personal narrative, and a brilliantly executed superhero origin story – and I do love a good origin story. Danny – Daniella – is transgender and a lesbian. Sarah, her best friend and partner in crime, is Latina. Doc Impossible is attracted to women. One character becomes an amputee during the story, and I think this will be explored more fully in the sequel. 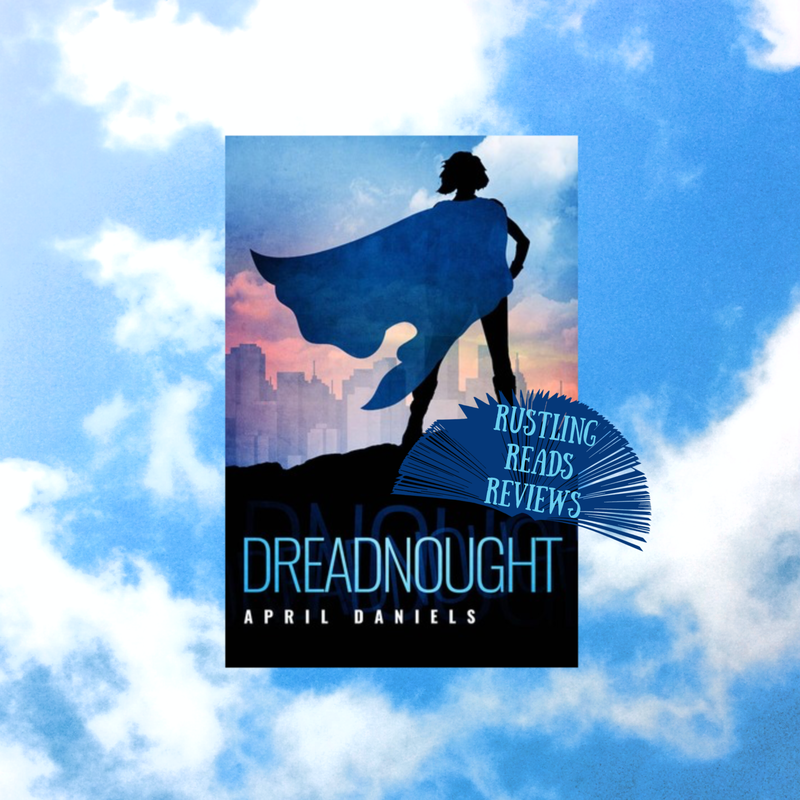 Dreadnought by April Daniels is published by Division Books in January 2017. You can buy it from Amazon here.